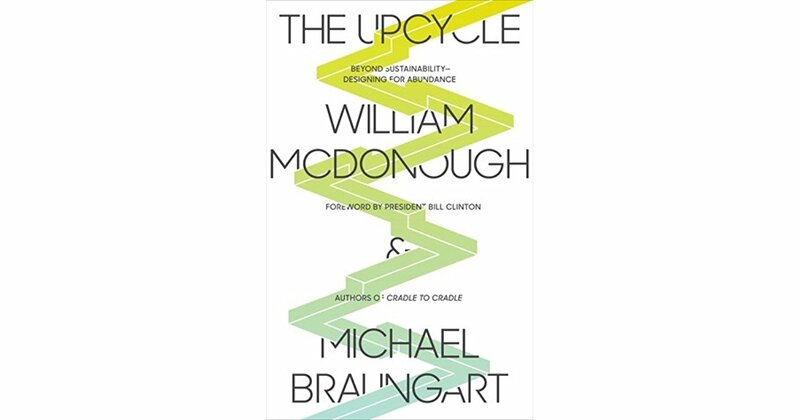 For anyone familiar with the concept of cradle-to-cradle, William McDonough should need no introduction. As an architect and preeminent figure in sustainability, he has championed a new way to create and recreate products. Aleesha Callahan chats to McDonough over the phone from the US to find out about some of his latest endeavours, including a newly rereleased carpet collection with Shaw Contract. Aleesha Callahan: How would you describe cradle-to-cradle in the simplest way possible? 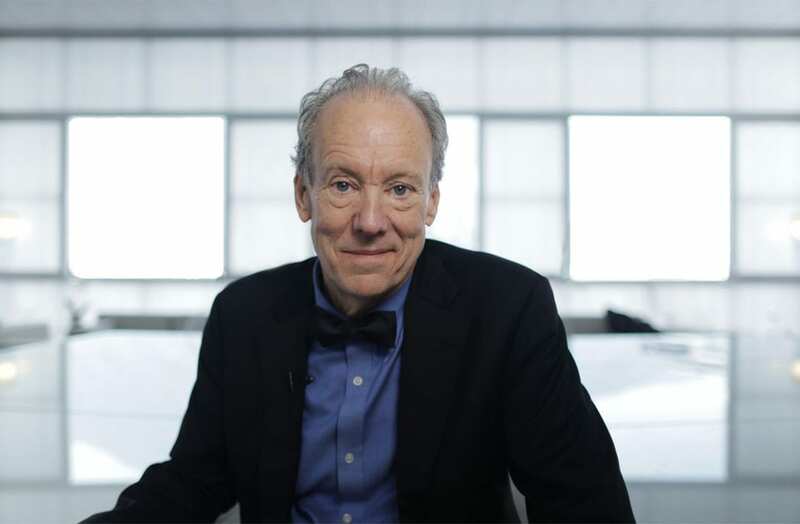 William McDonough: Cradle-to-cradle is the creation and qualification of a circular economy. It’s a way of designing and producing that honours all future generations by designing and manufacturing for next use, instead of end of life. So rather than cradle-to-grave, which is a take, make, waste system. Cradle-to-cradle follows a take, make, retake and remake system. It allows us to share the present with the future with grace and dignity. It’s really about quality first and making sure that things are designed to be safe and healthy in biological or technical cycles. It’s about ensuring that things are designed to go back to soil safely, or back to industry safely without contaminating each other. That’s the first order of business because if we recirculate poisonous things, it’s even worse. You recently released another book; can you tell us about it? It’s called, The Upcycle: Beyond Sustainability – Designing for Abundance. It’s a small book, but could be considered a coda to cradle-to-cradle. It sort of updates what has happened since 2002. Essentially it’s about observations, reflections and new revelations. How have you seen architecture and products change since 2002? It’s been fun to watch. First of all, now that cradle-to-cradle has really become the gold standard in LEED certification, you can actually get two points for cradle-to-cradle because it includes custom improvement and optimisation. We actually just found out today that our first fragrance lines are coming out FM certified [by the independent testing arm of international insurance carrier FM Global], which means we have some of the most secretive materials that humans have ever made now being released and shared. Traditionally, fragrances and those kinds of chemistries have been kept under wraps and never disclosed. Now we’re able to assess them down to their parts per billion. That’s a revolutionary moment and it’s all occurred in the last six months. Another big change has been in the apparel sector; we’ve just seen the opening of a Fashion for Good initiative in Amsterdam, which is based on cradle-to-cradle. I’ve also created a concept that I’m going to be using with children called the Five Goods. It’s a program to keep it really simple for children – like what is good, what is bad. Clean water is good, dirty water is bad; available water is good, no water is bad. Every child deserves clean drinking water. How do we do that as a species since we’re so clever? If that’s the mission, then it’s relatively simple. There’s good and there’s bad; for example, thriving cities are good, cities being bombed are bad. Park 20/20, Netherlands by William McDonough + Partners, Delta Development Group, VolkerWessels and Reggeborgh Groep. It’s important that there’s always a constant improvement. Our project Park 20/20 in the Netherlands is a great example of that. Over the last decade, every building we do has more and more cradle-to-cradle certified products in it and the way we do it is slow and steady. It was 20 years ago when I won the Presidential Award for Sustainable Development and someone from the press came up and asked me, “Well, how long is this sustainability stuff going to take?” What? It’s going to take forever, that’s the point! So we just keep improving and keep on going, but I do feel an incredible momentum right now. Now that we’ve cracked the code on fragrances. How did that come about? Have you been able to change something at the government level to make companies share their perfume recipes? Oh no, we have fragrance companies that have adopted us. It’s taken 10 years. I see regulations as signals of design failure. If you’re regulating it, it’s because society is afraid, probably for good reason. So you need to slap a regulation on it. From a business perspective, a regulation is a cost, which doesn’t necessarily produce a value because it’s just a cost. The goal should be to design things that are so safe they don’t need to be regulated. You’ve also worked with Shaw Contract and are relaunching a collection that you did with them quite a few years ago. Can you tell me about the process – how the designs came about and how you worked with Shaw to develop a cradle-to-cradle product? I’ve been working for many years with carpet industries. Basically, the concept is, you can sell the people the carpet because the transaction is pretty straightforward, but it should be seen as a service. You want the product back and you stay in a relationship with the customer. You don’t need to go through literal leasing because that involves lawyers, insurance and lots of transaction costs. So with Shaw Contract, it’s as simple as having 1-800-CALL-SHAW on the back of the carpet. We created that concept and I presented it to various carpet companies over the years. Some of whom still make PVC carpet, which I can’t understand because it’s not an optimised material for this use and highly concerning when considering some of the health effects. The rerelease of ‘A Walk in the Garden’, a collaboration between William McDonough and Shaw Contract. So Shaw Contract listened and then they went quietly about doing it, and the best thing is that it worked. They went from producing PVC carpet tiles, which can produce dioxins and tonnes of other nasty things, to a thermoplastic polyurethane backing and a nylon six-phase fibre, which is chemically recyclable. And the beauty is it turned out that it was lighter, more cost-effective and just works beautifully. After that we decided to design something together. 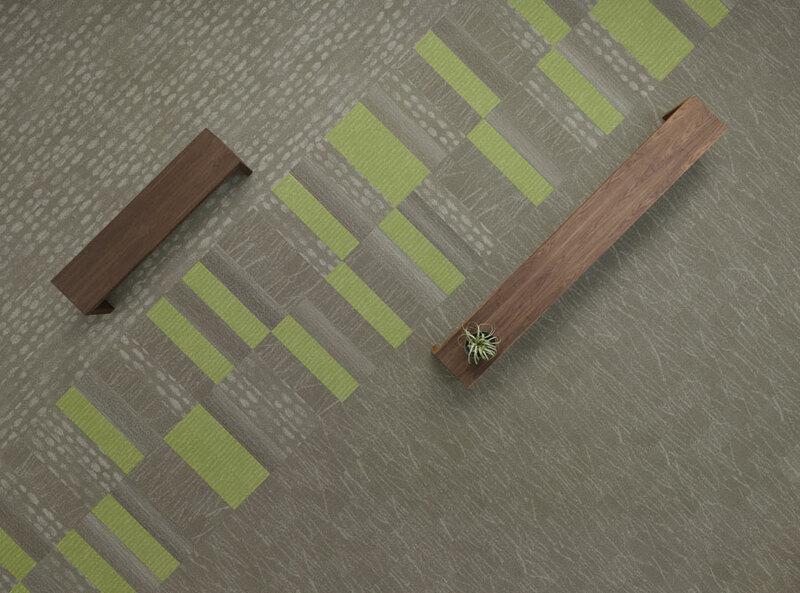 I wanted to design a lighter carpet and tell the story of cradle-to-cradle. I designed a collection called ‘A Walk in the Garden’ and it is based on images that I took in a garden at Chengdu, China. When I was there, I was with the chair of the Chinese US Centre for Sustainable Development [Deng Nan], Deng Xiao Ping’s daughter. And we were walking in this ancient garden and I had a new digital camera, because they’d just come out then. I walked around taking pictures of the ground and various things in the garden and it became the basis for the collection. Now it’s being rereleased with some new colours and a new shape, a horizontal tile instead of a square. Is there any industry that you think just needs to open its eyes and catch up? I think all of them, everybody wants to, but they just haven’t been given the tools. If you give somebody a tool that they can use, they can build something with it. And often the tool is agnostic, because the value of the tool comes from the intention to use it. For example, if you give a child a hammer, it becomes a toy; give it to a carpenter, it becomes a house and if you give it to a maniac, it becomes a weapon. So it’s the tool that’s innocent. It’s the intention of the user that’s the crime. I think that’s actually what we’re looking at here. It’s time for us to have tools that are actually embedded with value. So the cradle-to-cradle design framework is embedded with goodness. From good materials to a good economy, to good energy and water – it all adds up to good lives. In 2003 Shaw Contract worked in collaboration with Cradle to Cradle visionary William McDonough to design ‘A Walk in the Garden’, their first-ever collection featuring both EcoWorx backing and Eco Solution Q fiber. This collection’s design framework helped drive the development of the Cradle to Cradle certification process. Renewed and revisited, Shaw Contract is proud to relaunch ‘A Walk in the Garden’ in 2017 with a fresh colour palette and new tile size. Expanding on their connection with nature, and made for positive impact. Shaw Contract is a content partner of ADR. To arrange a sample contact Shaw Contract on 1800 556 302 or via the website. Lead image by Marta Chierego.